Bonnie and Clyde in March 1933. This is a photo found by police at the hideout in Joplin, Missouri. 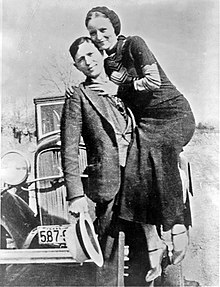 Bonnie Elizabeth Parker (October 1, 1910 – May 23, 1934) and Clyde Chestnut Barrow (March 24, 1909 – May 23, 1934) were American outlaws and robbers. They were from the area around Dallas. They traveled the Central United States with their gang during the Great Depression. Clyde is known today for his bank robberies. However, he preferred to rob small stores or rural gas stations. The gang is believed to have killed at least nine police officers and several civilians. The couple were eventually surprised and killed by police in Bienville Parish, Louisiana. A 1967 movie about them, Bonnie and Clyde, stars Faye Dunaway and Warren Beatty. ↑ Hinton, Ted and Larry Grove (1979). Ambush: The Real Story of Bonnie and Clyde. Austin, TX: Shoal Creek Publishers. ISBN 0-88319-041-9.